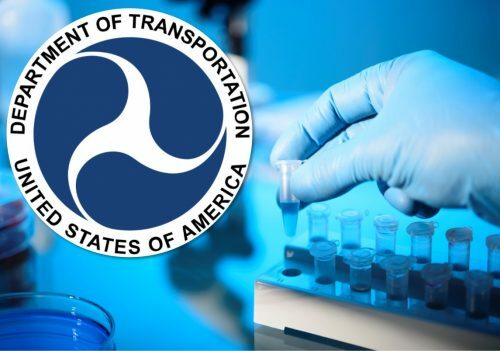 Today, April 23, 2019, the Department of Transportation (DOT) published a final rule that makes minor technical corrections to the OST, FAA, FTA, and PHMSA regulations governing drug testing for safety-sensitive employees to ensure consistency with the recent amendments made to the Department of Transportation’s regulation, “Procedures for Transportation Workplace Drug and Alcohol Testing Programs,” which added requirements to test for oxycodone, oxymorphone, hydrocodone, and hydromorphone to DOT-regulated drug testing programs. The changes to the Department’s regulation make it necessary to refer to these substances, as well as the previously covered drugs morphine, 6-acetylmorphine, and codeine, by the more inclusive term “opioids,” rather than “opiates.” This rule amends the term in the FAA, FTA, and PHMSA regulations to ensure that all DOT drug testing rules are consistent with one another and with the Mandatory Guidelines for Federal Workplace Drug Testing Programs. In addition, this rule makes a conforming amendment to include the term “opioids” in the wording of the Department’s annual information collection requirement and clarifications to section 40.26 and Appendix H regarding the requirement for employers to follow the Department’s instructions for the annual information collection. To learn more about this final rule, visit their web page athttps://www.transportation.gov/odapc/frpubs. 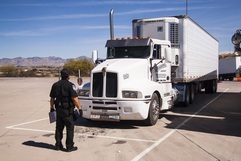 The FMCSA has released an official notice proposing to completely eliminate the requirement that trucking companies obtain a DOT-specific employment application. If implemented as proposed, this will radically affect your hiring practices and make it more difficult for you to hire drivers. We’ve been following the FMCSA’s activities on this proposal since it was first mentioned last year. The FMCSA regulators are now at the point in the rulemaking process where they want to hear how the proposal will affect actual trucking companies. That is, they want to hear from you. The FMCSA has asked specific questions directed to carriers in the industry on how the proposed changes will affect hiring drivers. Read on for more information and our suggestions of how best to address these questions. This is a valuable opportunity to give your feedback on an issue that will impact you significantly – you can do so at this link. This week, FMCSA launched a new website with information about the Commercial Driver’s License Drug and Alcohol Clearinghouse. Visit https://clearinghouse.fmcsa.dot.gov to learn more about how CDL drivers and their employers will be required to use the Clearinghouse beginning January 6, 2020. You will be able to sign up for email updates. 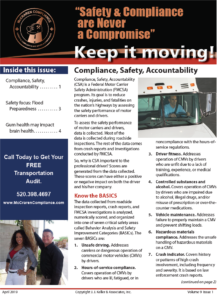 FMCSA has updated the CSA SMS Website with the February 22, 2019 results. 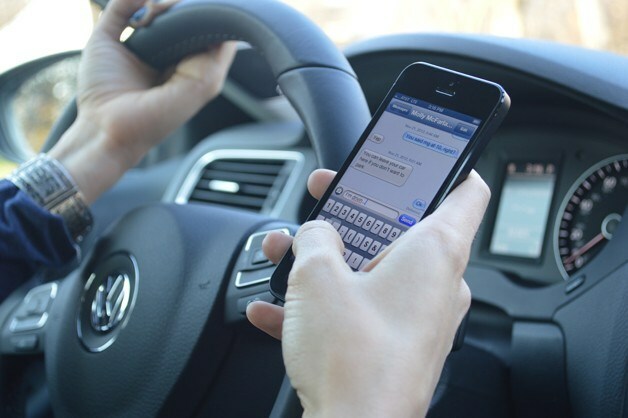 Arizona’s first statewide texting-and-driving just cleared a significant hurdle. Senate Bill 1165 passed the Senate Monday on a 20-10 vote, and now heads to the House. The bill passed on a 20-10 vote. All 10 “no” votes came from Republicans. Both Democrats and Republicans voted in favor of the bill. The bill would ban any use of an electronic device with one’s hands while driving — allowing for use of “hands-free” devices like headsets or bluetooth technology built into the car. The bill does have exceptions for emergencies, or licensed individuals. Arizona remains one of only a few states without a full, statewide ban on texting while driving — though many municipalities, cities and counties have ordinances against it. The statewide bill would override those local laws. You can read the full bill here. PHOENIX – The Arizona Department of Transportation will host a public meeting to present final design plans for an upcoming project that will improve traffic flow on US 93 between SR 89 and Tegner Street in Wickenburg. The public meeting, which will be held from 6 to 8 p.m. Tuesday, March 5, at the Wickenburg Community Center on 160 N. Valentine St., will present project information and give the public opportunities to provide comments. The project includes widening US 93 to two lanes in each direction, constructing raised center medians and constructing frontage roads and roundabouts at Rincon, Cope, Vulture Mine and Scenic Loop roads, and at State Route 89. Construction is currently scheduled for fiscal year 2020. Residents, business owners and other stakeholders are encouraged to attend the meeting, learn more about the project and submit comments. Representatives from the ADOT study team will be available to answer questions. All comments must be received by April 5 to be included in the public record. For more information on this and other US 93 projects, visitazdot.gov/US93corridor. FMCSA recently launched the Motor Carrier Safety Planner, a new online guide to help large truck and bus companies better understand and comply with the Federal Motor Carrier Safety Regulations. 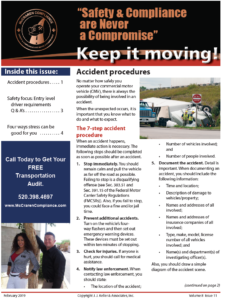 The safety planner provides plain-language summaries of safety regulations along with sample forms and templates. 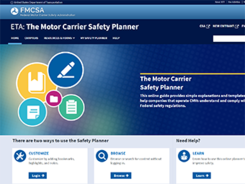 Visit the Motor Carrier Safety Planner site to watch video tutorials and learn how to build your personalized planner today. 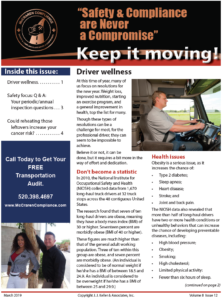 FMCSA has updated the CSA SMS Website with the January 25, 2019 results.